Opening day: Win, 4-3. In spite of Jeanmar Gomez’s best efforts in the 9th inning (serving up a 2-run home run to bring the score to 4-3), the Phillies were able to hold on to the victory thanks in large part to a series of unlikely extra base hits – Homers from Cesar Hernandez and Freddy Galvis, and a triple from pitcher Jeremy Hellickson (who also acquitted himself fairly well on the mound, allowing 1 run but only striking out one batter through 5 innings). As far as starts to seasons go, 1-0 is the best you can hope for. Game 2: Loss, 0-2. After an excruciating wait (offseason be damned – there isn’t a longer wait in baseball than the one between opening day and Game 2), the Phillies resumed their 2017 season. Jerad Eickhoff was his regular underrated effective self, pitching into the 7th and striking out 6. The offense gave him no room for error, and when Eickhoff allowed 2 runs, it sealed the loss as the Phillies got shut out. Game 3: Loss, 4-7. At one point, the Phillies had a 4-1 lead an a win expectancy of 81.4%. This game would not have a happy ending for the Phillies phaithful (phathphul? ), as Clay Buchholz showed the Phillies front office why he was able to be acquired for such a low price. Exiting the game after the game was knotted up at 4 apiece, Buchholz was then relieved by Adam Morgan, who’s debut did not go any smoother. If there’s any consolation, it’s that there probably was only a dozen people watching given that it was a game between the Phillies and Reds in early April. Game 4: Loss, 6-7. While the final score gives the impression that there was a close game between the Phillies and the visiting Washington Nationals, for a while the home opener was anything but. The Nats scored early and often, capped off by a 5th inning 3-run shot by Jayson Werth (booo) that made the score 0-7. The Phillies rallied back to make it a 1-run game in the 9th inning but were unable to seal the deal. Vince Velasquez had the most Velasquez-esque line – 4 innings pitched, 4 earned runs, and 10 strikeouts. Out of the 12 outs Vinny recorded, 10 were by the K. Minimum 4 IP (lol), he now has the highest ever single season K/9 mark. He is as amazing as he is frustrating. Game 5: Win, 17-3. Hands down the most exhilarating win, the Phillies put up a score that looks like it’s straight out of a football game (Note: As much as I had hoped, there’s never been a game between the Redskins and Eagles that ended with a score of 17-3). Birthday boy Jeremy Guthrie allowed 10 runs in 2/3 of an inning, which maths out to an ERA of 135.00. His belated birthday gift from the Nationals was being designated for assignment. The Phillies went on to score 2 more runs in the 1st inning (a franchise record for runs in the 1st inning), and 17 runs overall (topping their season total of 14 in a single game). The best Nationals pitcher of the night was slimmed down former Phillie Joe Blanton, who managed to throw 3 mercifully scoreless innings. Somehow relegated to the backend of the rotation, Aaron Nola proved he had frontline stuff, running a 7-2 K-BB ratio in 6 innings. At some point, Buchholz and/or Hellickson will be dealt, and Nola will move “up” in the rotation. Game 6: Win, 4-3. My daughter’s first ever baseball game was a walk off win to seal the first series win of the year. Jeremy Hellickson was dealing, only allowing a single hit before exiting after 5 with an arm cramp. Howie Kendrick capped off a strong first week with the Phillies with a double to put the Phillies up 3-0. Things were going a little too easy for Jeanmar Gomez’s preference. He had been rehearsing how to stir up some drama as the Phillies closer, and wanted to put it into practice. With 2 on and 2 outs in the top of the 9th, Gomez let fly a 92 MPH fastball. The results of the pitch were remarkably similar to what happened on Opening day. 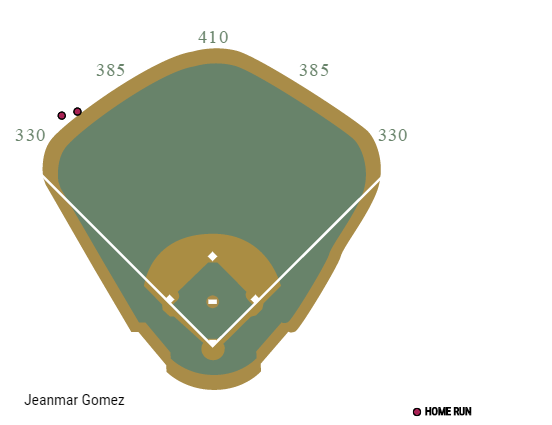 Unlike Opening Day, this home run tied the game and gave Gomez his first blown save of the season (BRING IN NERIS). Cesar Hernandez would come to the rescue in the bottom of the 9th, sparing Gomez and the Phillies from the worst case scenario with a walk off single. With the win, the Phillies were once again .500. BELIEVE. For those wondering – the Phillies all-time Opening Day record is 63-70-2. While not a particularly great record, it’s been especially bad as of late. The Phillies all-time Opening Day record was .500 (59-59-2) in 2002. Since then the Phillies have gone 4-11, tied for the worst in the majors with the Athletics. Coincidentally, this former Philadelphia franchise was also at .500 on Opening Day through 2002. Must be something in the cheesesteaks. If you were wondering about the two ties the Phillies had on Opening Day – yes, there used to be ties in baseball. The two ties were in 1924 against the Boston Braves and 1939 against the Brooklyn Dodgers. Both games went 11 innings before being called. Everyone’s favorite trusty resource Wikipedia mentions that following – “Before 2007, tie games ended by weather were replayed from the start, but since 2007, the games are continued from where they left off.” 2007! Much more recently than I had thought. Only a season later, Phillies would see this tie game rule change in Game 5 of the World Series, delaying what would end up being the second world series won by the franchise (not that I needed to remind you of that). In the past, a game like this would have been declared a tie. TMYK. Bonus trivia: On September 29, 2016, the Pirates-Cubs game was rained out. With no time to make it up and no impact to the playoff standings, it was declared a tie, the first one since 2005. The Phillies are currently sitting on a 3-3 record. Can they manage to crack the above .500 mark this season? Possibly. It might seem like a pessimistic thing to be floating out there so early in the season, but in 2015 the only day that the Phillies had more tallies in the win column than the loss column was on April 11 (the day I got married – happy anniversary!). Regardless of the record, remember that wins and losses aren’t the only way to measure a team’s progress. For the franchise’s sake, let’s hope that we see development in the minors moreso than wins in the majors. UPDATE: Jeanmar Gomez is deleted as closer, Joaquin Benoit is in. Headline was no sooner published than it was obsolete.